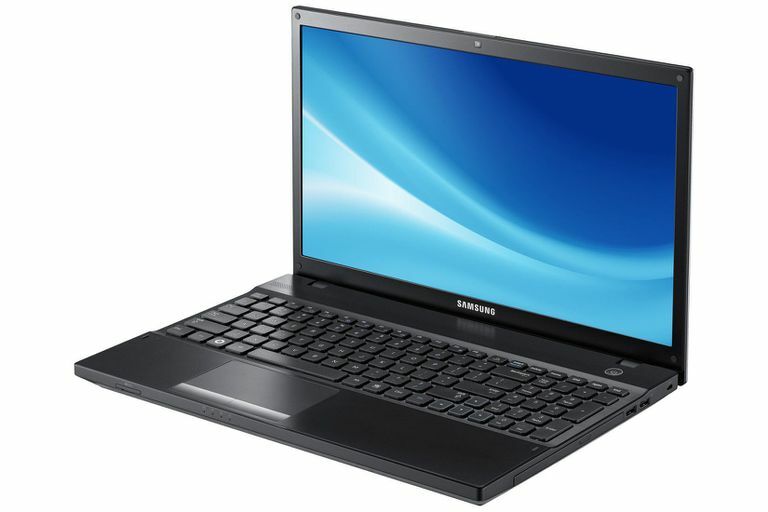 Samsung has since dropped out of the budget section of the US laptop market and models such as the NP300V5A are no longer available. Instead, the company is focusing in on Chromebooks for its low-cost offerings. If you are looking for a current low-cost laptop computer, check out the Best Laptops Under $500. 14.4" x 9.5" x 1.2" @ 5.5 lbs. The Samsung NP300V5A-A03US externally is nearly identical to the 13-inch Series 3 laptop we looked at recently. Sure, it is larger in order to fit the 15-inch display, but it has the same plastic exterior which is functional but still feels very cheap. Thankfully, the keyboard and trackpad are still some of the best that can be found in this price segment. The larger size allows for a numeric keyboard that doesn't impact the overall size of the delete, enter or right shift keys. It also includes one of the larger trackpads for a 15-inch laptop. Just be careful not to hit it on accident with your palms while typing. Powering the budget version of the Series 3 is the Intel Core i3-2310M dual-core processor. This is a fairly common processor to be found in a $600 laptop system. It provides sufficient performance for the majority of tasks that consumers may have. It is only when doing demanding tasks such as desktop video that the performance will lag compared to slightly more expensive systems with quad-core processors or the faster Core i5. It features 4GB of DDR3 memory which has become the standard for most laptops and provides a smooth overall experience with Windows 7. Storage features are just average for a budget laptop priced under $600. It comes with a 500GB hard drive that provides a decent amount of space for applications, data and media files. It spins at the traditional 5400rpm rate which gives it typical performance. One downside to the Series 3 design is the lack of the new USB 3.0 or eSATA ports. This means expanding the storage with an external drive will be limited to the USB 2.0 interface speeds. This isn't a huge issue in the low-cost segment as many laptops still do not feature either of these ports but it is still disappointing for a relatively new design. A standard dual layer DVD burner handles playback and recording of CD or DVD media. The 15-inch display on the Series 3 NP300V5A offers a larger overall screen than the 13-inch model but uses the same 1366x768 resolution that is common the most laptops on the market right now. It features a glossy coating that is found in just about every consumer laptop which helps contrast at the cost of increased glare and reflections especially when used outdoors. The graphics are handled by the Intel HD Graphics 3000 that are built into the new Core i3 processor. It is a nice upgrade from past Intel graphics solutions but it still lacks sufficient 3D performance to be used as a casual PC gaming platform. What it offers in exchange is the ability to accelerate media encoding when using QuickSync compatible applications. Just like the Series 3 13-inch model, the NP400V5A-A03US comes with the same six cell battery pack with a 4400mAh capacity rating. In DVD playback testing, the laptop was able to run for just under three hours before going into standby mode. This is a bit slower than the Series 3 13-inch model which is somewhat surprising as it had more powerful components. Still, this is slightly above the average for this price category. It should yield over four hours of running time with more traditional usage.